Where is Oktoberfest in Munich? At the Wiesn, or Theresienwiese, in the central part of the city. It is easily accessible by public transport and taxis from the central part of Munich, the Marienplatz and within walking distance of the main train station Hauptbahnhof. Oktoberfest is held annually and commences on the second last Saturday of September and concludes on the first weekend of Oktober each year. Munich is a major tourist destination and there is plenty to see and do outside of visiting Oktoberfest. 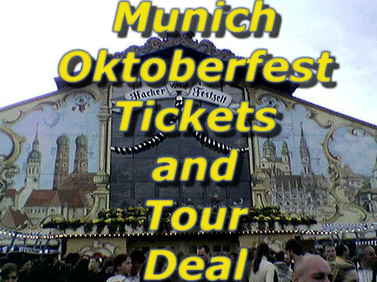 We have provided you with a number of sightseeing options for both Munich and the Oktoberfest. One of the easiest ways to enjoy Oktoberfest is to join one of the many Oktoberfest Tours, who often offer plenty of Oktoberfest in Munich Deals. Below we have information on some of the great tour operators at Oktoberfest. The following tour operators are some of the biggest and best in the business and they will be sure to provide you with an amazing experience that is sure to cure your travel FOMO. ﻿ Click on the Link Below to get Free Unlimited Beer and Sangria when you book Oktoberfest with Stoke Travel. Stoke Travel offer various packages for Oktoberfest, and all involve camping at their massive Stoke Travel party campground in Munich, where they will provide you with your accommodation, hot breakfast every morning, dinner every evening and a massive campsite party each night, including onsite DJs, live interactive radio show - a festival within a festival spectacular. You even have the option to upgrade to all-you-can-drink beer and sangria at the campsite! How good is that? They also have bus transfers available from Barcelona, Amsterdam and London. Stoke Passport Holders can get a 3 night all-inclusive Oktoberfest package including accommodation at the Stoke campsite and unlimited beer and sangria. Want to know ABOUT STOKE PASSPORT? 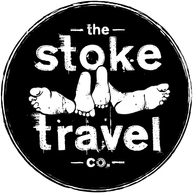 Check out all the details on the Stoke Travel Passport here. You can either camp at Oktoberfest with Busabout, or stay at the Busabout Oktoberfest Hostel for Oktoberfest. The accommodation options are either a munich hostel that is a short walk to the Oktoberfest grounds or camping in pre-erected tents at Munich’s biggest Oktoberfest party campground located only a short 10-minute coach transfer to Oktoberfest. Busabout tours have either coach tours from london or flight options available or you can make your own way to Munich and hook up with their accommodation only options. Topdeck have a great number of trips to Munich for Oktoberfest. You can experience a stein or two with Topdeck at Oktoberfest in Munich both hotel and camping options. Once again you can even make your own way there or get transport by coach down from London. Topdeck has either 4 day or 5 day camping trips for Oktoberfest, where you will stay only a short 10 minutes transfer to the Oktoberfest grounds. If camping is not your thing then the Topdeck 4 day hostel trip might be just your thing. Either way, I'm sure you will have a great trip with Topdeck. Prost! Contiki Holidays has a number of 4 to 7 day tour options for Oktoberfest to suit all budgets. The accommodation options are either a quality hotel or munich hostel that are a short walk to the Oktoberfest grounds or camping in pre-erected tents at Munich’s biggest Oktoberfest party campground located only a short 10 minute coach transfer to Oktoberfest. Contiki Holidays have either coach tours from london or make your own way there and hook up with the accommodation only options on offer. More commonly referred to as Beerfest, The Oktoberfest in Munich is a 16 day festival celebrating what else, but beer. The beer festival is held annually and one would presume with a name like Oktoberfest it would be held in October, but it actually commences in the middle of September and concludes on the first weekend of October. Each year during the 16 days festivities more than 6 million people from around the world attend the event and generally more than 6 million litres of beer is consumed. That’s 1 litre for every man, woman and child who attends! In 1994, the schedule was modified in response to German reunification so that if the first Sunday in October falls on the 1st or 2nd, then the festival would go on until October 3 (German Unity Day). Thus, the festival is now 17 days when the first Sunday is October 2 and 18 days when it is October 1. So how did this massive drinking session come about I hear you ask? Well just over 200 years ago, the Crown Prince of Bavaria, a young guy called Ludwig, later to become King Ludwig I, married Princess Therese of Saxe-Hildburghausen. This occurred on October 12, 1810. All the residents of Munich were invited to attend the festival, which was held on the fields in front of the city gates, to celebrate the royal wedding. These fields were named Theresienwiese in honour of the new Crown Princess. This field and name remains the same to this date and it is where Oktoberfest is held each year. When translated into English Theresienwiese means “Theresa’s meadow” and these days the Munich locals simply call the area the “Wiesn”. As part of the festivities that day were some horse races, which actually marked the close of the event. This event was seen as a celebration for the whole of the local region of Bavaria and the following year they decided to run the horse races again for the first wedding anniversary. This was the beginning of what we now know today as Oktoberfest. The festival was eventually lengthened and moved to commence in September to allow for better weather conditions. Drink the best beer in the world of course. However, visitors may also enjoy a wide variety of traditional food. Some Bavarian delicacies include pork knuckles, bratwurst sausages, roast chicken, potato/bread dumplings and of course pretzels. Not only are there massive beer tents, but the site also has numerous amusement rides, schnapps tent and activities to amuse both young and old. All the beer tents play different types of music and have entertainment to keep the crowds buzzing. The price of a 1 litre stein (or Mass in german) is around 8 to 9 Euros, depending on the tent. However, always remember that if you want your waiter or server to return to get you another beer it is customary to tip them, so generally allow 10 Euro’s for a beer. There are currently 14 large tents and twenty small tents at the Oktoberfest. The tents themselves are non-permanent structures that are constructed for and only used during the festival. To be in Munich for Oktoberfest is one of the must-do travel experiences. We have extensive information on all Oktoberfest travel and tour options available. With 6 million people going to Oktoberfest each year, Munich becomes a very busy place. Even though Munich is a major tourist destination and European transport hub, available accommodation and flights become hard to come by immediately prior and during Oktoberfest. We advise you to book as early as you possibly can. If you are an independent traveller and you like to book it all yourself, then we have all the tools required for you to get the best out of Oktoberfest. There is plenty of hotels in Munich that are within a short distance of the Oktoberfest grounds. So if you are looking for a hotel in Munich during Oktoberfest then you should check out our Accommodation booking page, where you will find both our Hotel and Hostel Search Engines. If you are looking for budget accommodation in Munich then we have provided both the Hostelbookers and Hostelworld search engines so that you can get the best accommodation deal during Oktoberfest. If you need to book a flight to munuch, we have a great Flight Search Engine that searces hundreds of online travel and airline websites to find you the best deal. With all our search engines all deals are located on one easy page for you to click, compare and book. If you're already going to travel in Germany, or anywhere in Europe for that matter, before going to Oktoberfest or travelling around the continent afterwards, it might be easier to catch a train to Munich. For example it is much easier and probably more cost effective to get a train from Berlin to Munich, or even from Frankfurt to Munich, than it is to fly. Check out our Rail Europe page, where you can purchase tickets and passes, as well as check train schedules.